The city’s top racing teams will be doing battle in the cut and thrust of the televised Tour Series it was confirmed at Wembley Stadium last week. Now in its ninth year, the Tour Series – for women it’s the Matrix Fitness Grand Prix Series – is one of the major features – some would argue The major feature – in the British racing calendar and will be the focus of the city’s teams for the whole of this coming May. “With whole Series now being held in May it’ll be four intensive weeks of racing with us traveling the length and breadth of the country, a pretty hectic month overall. But I think the whole calendar works better this way as we can focus on the crits before moving back to full-on road racing. It’ll be an exciting month for us all”. 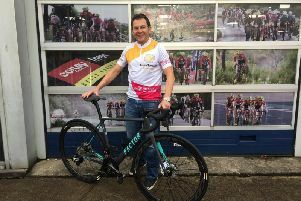 For 2017, the women’s Drops Cycling Team will be joined by the newly formed Team OnForm who will be provided with Bianchi bikes by Stony Stratford’s Twenty3c cycle store. Drops debuted last year but they only missed out on being the 2016 Matrix champions in the final 150 metres of the very last race of the year. Now firmly established in the women’s World Tour peloton, the Bletchley based team have already confirmed that, despite their international programme, they’ll still be competing as fiercely in this year’s Matrix races. Team OnForm will be one of the thirteen women’s teams who’ll be competing in the Matrix Fitness Grand Prix Series that will be racing at 8 of the thirteen locations that make up this year’s Tour Series calendar. Team Manager Simon Howes explained the attraction of the Matrix Series: “The Series is huge to a team like ourselves. It’s a massive goal for the team, all the riders want to be as successful as they can be at such a huge series of races. As a team, we’ll get great coverage and with all the races being televised it brings great TV exposure to the sponsors. Everything about the series is what both the sponsors and riders want and require”. The Tour Series competitors will kick off the racing in Redditch – a favourite for many experienced Tour and Matrix Series riders - on 9 May and then they’ll all face an intensive programme that will see them travelling as far north as Aberdeen before the Series finale in Stevenage on Bank Holiday Monday at the end of the month. In addition to the landmark race in Wembley there are also new, Saturday night-time races in Bath and the always popular cobbled Durham round which usually features hectic, heart-in-the-month race defining moments. And with all races being televised, all the race action with be accessible to all.